Castell Coch is set high in a wooded hillside above the village of Tongwynlais, just on the outskirts of Cardiff. Its picturesque location and stunning architecture mean that it is often used as a film location. More recently the castle has also been open for civil wedding ceremonies. 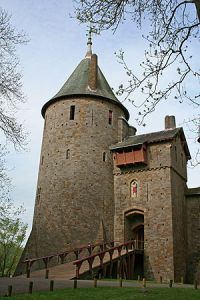 Castell Coch was built in the late nineteenth century on the remains of an earlier medieval fortification. It was designed by William Burges for his employer, the third marquess of Bute, for whom he had previously redesigned Cardiff Castle. Burges created a spectacular ‘fairytale’ castle in medieval gothic style. Open every day except Christmas Day, Boxing Day and New Years Day. 1st November – 20th March 9.30am – 4pm Mon to Sat, 11am – 4pm Sunday. By car: Exit the M4 at Junction 32 onto the A470 and follow signs for Tongwynlais. By bus: The nearest bus stop is approximately 1km from the castle in the village of Tongwynlais. It is served by Stagecoach service 132, which runs every 30 minutes between Cardiff and Pontypridd. On Sundays the service runs every 60 minutes.